Apple has finally releases its full and final version of OS X Mavericks 10.9.2 (Build: 13C64) Final Update for Mac users worldwide. If you're running an old OS X 10.9 or OS X 10.9.1 versions than OS X 10.9.2 Final Update is recommended upgrade for all OS X Mavericks users because it contains several fixes, improvement, system enhancement, performance, stability and introduction of new features etc. Apple Mac users can Download OS X Mavericks 10.9.2 Final Update/Setup .DMG Files via Direct Links available officially from Apple. According to official changelog of Mac OS X Mavericks 10.9.2 (Build: 13C64) Update, it holds fixes and improvements for FaceTime Audio, Contacts blocking control for iMessage, FaceTime and fixes for Mails and VPN etc. Additionally this new update is important because it includes a patch and fix for SSL connection verification and data encryption bug using the SSL protocol which has been fixed in this update. 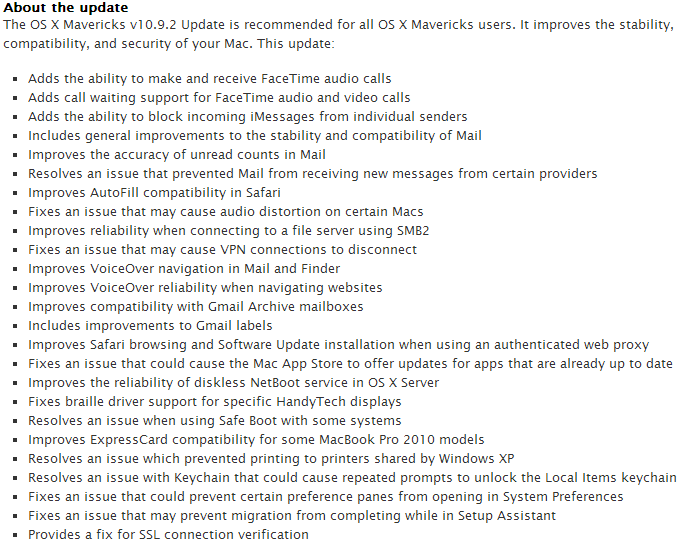 You can read full official changelog and what's new features of OS X Mavericks 10.9.2 Final Update in below image. Apple users can officially download and install OS X Mavericks 10.9.2 (Build: 13C64) Final Update from Mac App Store via iTunes for Free and also the Official Direct Download Links of OS X Mavericks 10.9.2 Final Update .DMG File and OS X Mavericks 10.9.2 Final Standalone Setup Installer .DMG File to manual update multiple computers/laptops is available below. Would be nice to have an md5sum of the large files we can compare to, especially when downloading large parts.